Mirren Glencorse, Vanessa Wong, the Worshipful the Mayor of Barnsley, Councillor Linda Burgess and Marisa Thornton. Three Art and Design students have won the Best of Barnsley Mayor’s Award for their artwork based on Picasso at an exhibition at The Cooper Gallery. 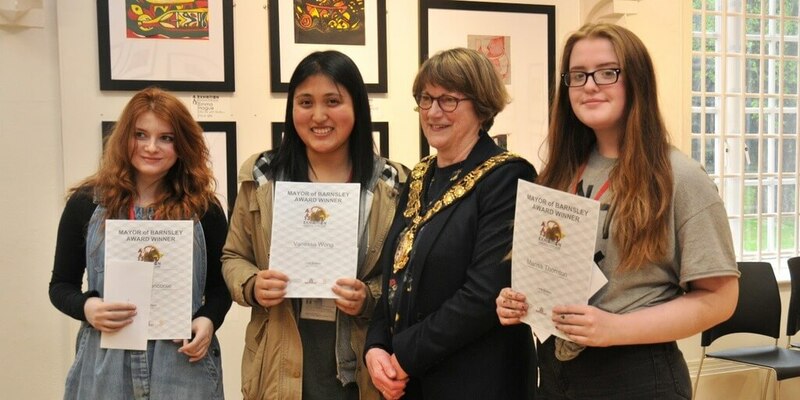 The Worshipful the Mayor of Barnsley, Councillor Linda Burgess, congratulated students Mirren Glencorse, Marisa Thornton and Vanessa Wong for their limited edition contemporary prints. Students were presented with £100 cheque and a certificate at The Cooper Gallery award ceremony.